Only GIF and SWF allow animations (SWF allows quite sophisticated animations, whereas GIF simply allows a series of images to be displayed in series). All the formats can be used to display pictures, although generally GIF, JPEG or PNG would be favored, if this is all your want to do. GIF allows up to 256 colors, whereas JPEG or PNG allow up to 16,777,216 colors. GIF or PNG are better than JPEG for displaying pictures which contain large areas of continuous tone, or very small text. This is because GIF and PNG are lossless formats, whereas JPEG is lossy and can result in loss of small details. JPEG is generally the best format for displaying photographs, although acceptable results can sometimes be achieved using GIF or PNG. There may be restrictions on when you can use some of the formats (especially SWF). This is because some banner rotation scripts and banner exchanges do not work with SWF. The same banner design saved in different formats may produce different file sizes. 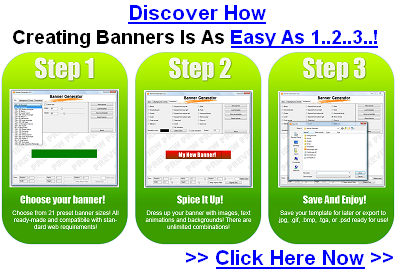 Again, there may be restrictions on what format is suitable for your banner because of this - as if buying banner advertising or using banner exchanges, there may be limitations on the maximum file size allowed.